Samba is an open source implementation of the file and printer sharing protocols used by Windows networks. These are known as the Common Internet File System (CIFS) and Server Message Blocks (SMB). Samba can be used in a number of different ways. Examples include, integrating Unix/Linux servers into Windows networks or in enabling Linux servers to act as Active Directory domain controllers. Erion Ltd has a long history of working with Samba on many different platforms in a wide variety of roles. Our consultants have an in-depth knowledge of the operation of Microsoft networks and the internals of Samba. At Erion we have worked with many of the worlds leading IT companies on Samba, providing training and consultancy. Erion is one of the few companies providing Samba training We have over 21 years of experience of providing Samba training. Our trainers have been working with Samba and related technologies since the early days of LANmanager and NetBIOS. Please contact us for your public and on-site Samba training requirements. Erion's consultants have extensive and advanced experience of both Windows and Unix/Linux environments. They have many years of experience of working with Samba and other Windows and Unix/Linux integration technologies. Erion consultants have written whitepapers and training materials for Microsoft and others. 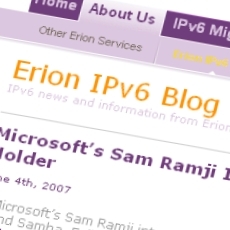 Erion leads the world in IPv6 solutions for Unix and Windows Integration. We work closely with the leading solution providers in this area and have a wide experience of the relevant technologies. Erion has worked closely with the Samba Team to IPv6 enable Samba3, Samba4 and the Linux CIFS client. Erion has created an IPv6 blog to provide information about our IPv6 services and our activities in IPv6. Our IPv6 Blog records many of our activities in IPv6 enabling Samba. These include work on IPv6 in Samba3, Samba4 and the Linux CIFS client.